Started in 2012, the Local Vision initiative was set up to support the development of Systems Leadership practice sin our public services. Overseen by the Systems Leadership Alliance, it brings together local and national government, the NHS, social care, public health, the voluntary sector, user-led groups, the private sector and leadership specialists. 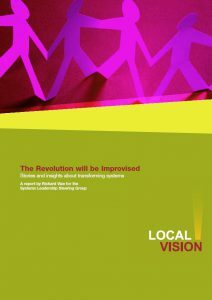 Local Vision has now provided support to over 40 localities across England, each of which looks to create change in a difficult or breakthrough issue: to develop Systems Leadership at a local level, to create new ways of working in support of delivering integrated services; and to achieve measurable improvements in health, care and wellbeing. Local Vision projects have proved particularly effective at supporting leaders to look outwards and into the future – beyond the bounds of their traditional roles, organisation and short-term difficulties – to find long term solutions to complex problems. Localities are paired with a Systems Leadership ‘Enabler’, who provides systems leadership support for the duration of the project. Enablers are commonly professionals with many years’ experience in leadership development, systems thinking, innovation practice and implementing change. • Bringing people together to work differently. From the start, a wide variety of people may be engaged – relationships between the service providers are essential and often mirror the relationships with the service users. The Local Vision projects which have been most successful have taken opportunities to re-evaluate, reassess and reinvigorate their work, to keep connecting and keep it focussed on positive outcomes for local citizens. Many systems leaders have realised that rather than using the project to simply address one particular wicked issue, the opportunity is there to instil a different way of thinking across the public services in their place which spreads the learning and approaches beyond those who worked on the original project. 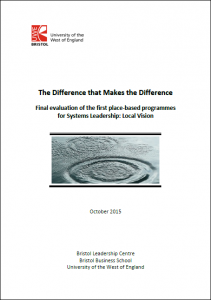 Local Vision projects have been developing Systems Leadership practice with colleagues in places for the last 4 years providing us with the opportunity to evaluate the impact of the Local Vision work, and the experience the Enablers have had introducing Systems Leadership, in localities. One of the major factors that has emerged is the strength of the Enablers acting as provocateurs in places. They have been enormously valuable in developing an understanding of, and commitment to, systems thinking amongst key partners in localities, keeping them on track to develop their leadership practice and make headway with their breakthrough issue. In many places the Enablers have been crucial in bringing together key partners in order to develop shared understanding of key issues. Findings from Local Vision suggest that the role of public health director can be a major catalyst for change, because it is not seen as being directly part of either health or social care. Many of the directors had become central figures in the work, trusted across the board. The Local Vision work found that effective collaboration requires leadership at every level, and just as much effort will need to be put into bringing those teams together as it was to getting the chief executives in a room. True service transformation is about rethinking services from a citizens perspective using a living systems lens, not knitting together existing, flawed ways of working. It is crucial that Leaders keep focused on the needs of service users, and appreciate that while integration may not release cashable savings it improves the experience of each individual, providing them with a dignified and personalised service. Sometimes difficulties have to be confronted and argued out. Such meetings can be tough, but if handled well they can achieve a breakthrough. Having an independent facilitator can help. 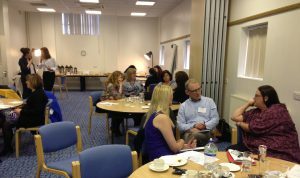 For example, it can help surface and create a shared understanding of the pressures experienced by one of the partners. • Service users, not organisations and services, must be at the centre. • Places need to recognise that co-producing services with users is hard. • Leaders need to see themselves as part of the collective leadership of the system, as well as a leader of their own organisation. • Collaborative skills are now essential for success in the public sector. • National bodies – notably NHS England, Monitor, Public Health England and the Local Government Association – need to live the values of collaboration, not pay lip service to it. • Leaders must hold themselves to account via their organisations and each other for modelling the behaviours they expect of others. • Organisations and staff need to think and act strategically – the squeeze on resources makes long term thinking imperative. • Leaders must identify and remove organisational, cultural and bureaucratic barriers which stop their staff collaborating. • Talk of service transformation and integration needs to be rooted in honesty about what organisations and systems need to do to make collaborative, citizen-focussed services a reality. But transforming services is hard. It involves significant changes to organisational and professional cultures and behaviours, which are often the most essential to make and the hardest to effect. This is regularly what the Local Vision work tries to address given that in order to affect real change, where Systems Leadership has worked well, it has obtained senior level organisational and political engagement to help cut through the scepticism.